Transfer-listed Posh midfielder Jack Payne (left) is unlikely to return to Gillingham. Photo: Joe Dent. Gillingham manager Justin Edinburgh has played down suggestions that Jack Payne could be returning to his club from Peterborough United. Posh director of football Barry Fry told the Peterborough Telegraph last week that there had been contact between the clubs about the 23 year-old midfielder. 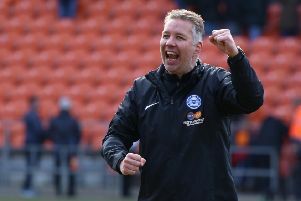 Payne was one of seven players transfer listed by Posh at the end of last season. He skippered Posh last season. But Edinburgh told Kent Online today (June 17): “here was a conversation before the end of the season, but it wasn’t as simple as Jack is coming back to play for us.